Welcome to another Project House feature! Thank you so much for all the lovely feedback on my first post. I'm really happy to show you yet another space in my new home. Like the rest of the our home, our entrance and stairway was a labour of love. We've put so much time and thought into it, and I hope it shows. Perhaps we were even a bit too obsessive about coordinating everything, especially my partner in crime, but all is well that ends well, right? We opted for a minimalist/ Scandinavian/modernist feel and stuck with the colour scheme. We focused a lot on the white aesthetic. We only broke the rules twice and both times it was my decision. Once was to include an antique piece in our otherwise all white living room. The other time was when it came to picking the stone for this stairs. Anyway, I don't think that minimalist inner decor needs to be all sterile. 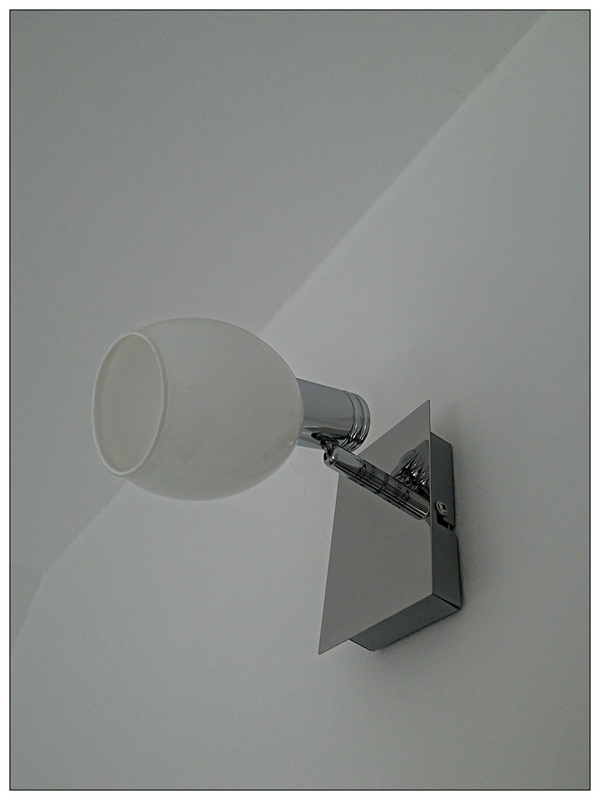 It is more about the certain aesthetic, clean lines and neutral colours. I do like the neutral colour palette we opted for. 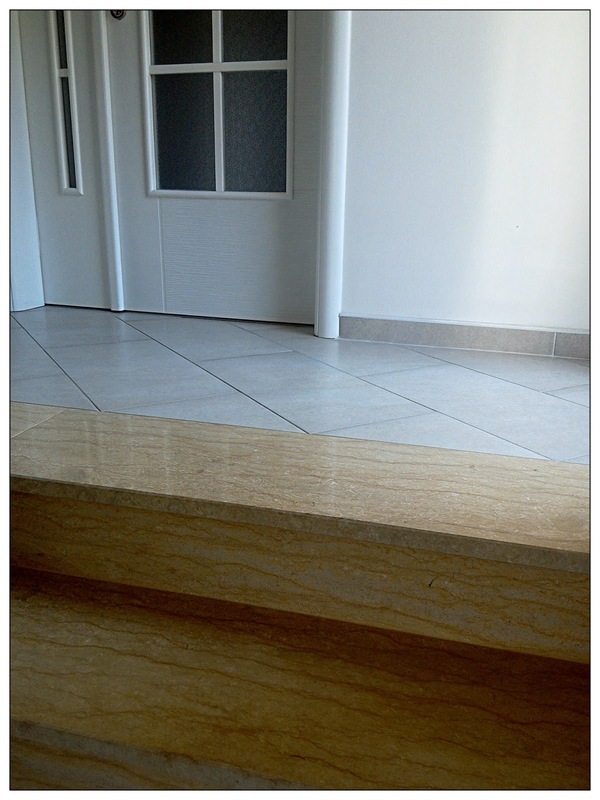 However, when I came to our stairway, I wanted to go with a warmer colour and I chose this absolutely gorgeous stone. It is natural stone so the pattern is absolutely unique. Every step has a different pattern. I could stare at it all day. I love it. What do you think? Did I make the right choice? I think it looks very luxurious. First of all, let me say that this stairway is not entirely made from stone. 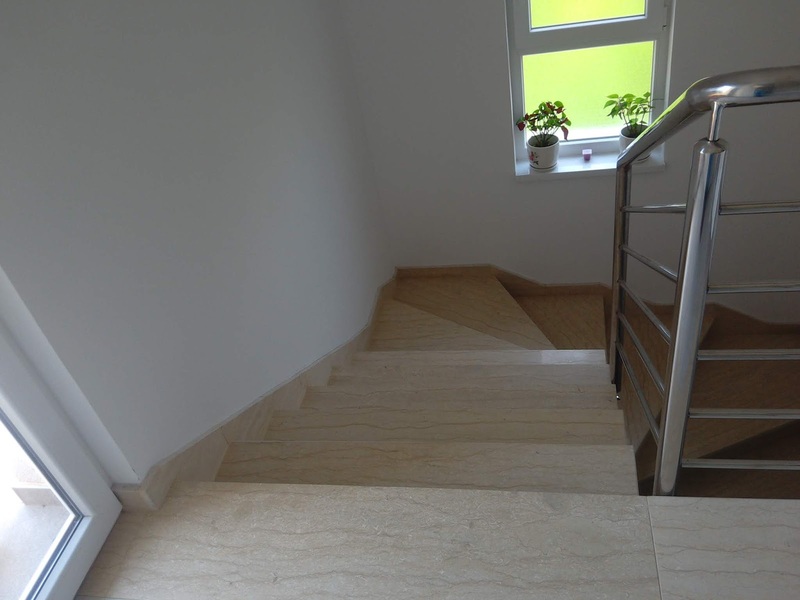 The stairs were made from concrete, which is known to be the best and most reliable material when it comes to stairs and stairways. So, when we started decorating our home, the stairway was already there, designed by my husband ages ago when he first started work on this home (long before he had met me). Concrete is a very durable choice, it's practically impossible to damage it, but it doesn't look very elegant. One of the tips that interior magazines offer is to mix it with wood. Personally, for us wood was never an option. Initially, we weren't sure whether we want to go for stone or ceramic tiles but we opted for stone in the end. I think stone is more luxurious than ceramic tiles, but in most cases it is also more expensive. Anyone, once we opted for stone, the next thing we needed we decide on was the colour and the type of stone. 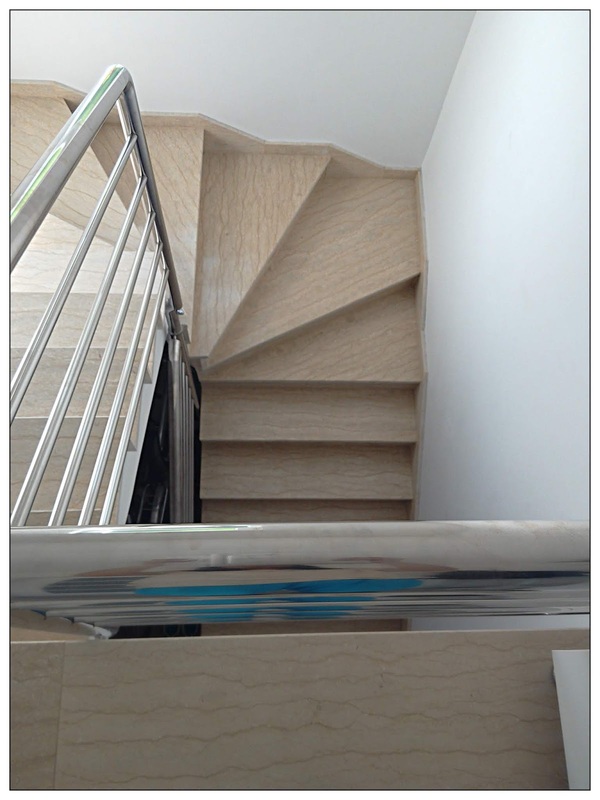 The advantages of using the stone are obvious as stone stairways are the embodiment of elegance. Stone stairways are a pretty common choice. In my experience they are easy to clean, but there are also some downsides. Natural stone installation can be quite complicated, but I can't say we felt it, since it was to workers and the company to figure it out. The workers did labour a lot on this stairway, they measured everything a hundred times and they worked on it for days to make sure everything is perfect. I'm not sure about the exact price, but generally speaking the installation of stone can be quite costly. So, that might be a downside. A lot of thought went into our stairway. I think the entrance to one's home is always something to pay special attention to, because it's the first thing we see when we walk into a house. I'm especially proud of this space because I do think that I have hit the jackpot with this stairway. I clean it every day because I'm obsessed with that shine. I love how polished the stone looks. Before we opted for this one, we went to every store that exists in this region, and finally I spotted this beauty when we went to see one of contractors that specialize in the stone work. As he was showing us the different stone options, I saw this one and it was love at first sight. You know that feeling when you just know? So, that's the story about our stairway. My husband ordered the aluminium fence and figured the shape and everything out, but I choose the stone. The tiles used are the same as the ones used in the kitchen. The same applies for the small balcony that is facing this side of the house (the same tiles as the one on the larger balcony). Above you can see the shoe cabinet. We had it custom made by the same guy who made our kitchen. I love how matching furniture items. Not to ruin the surprise element, but we did the same thing in another room. I'll talk about it more in the following posts. The succulent plant you can see placed on the show cabinet was a gift from a friend and I'm sorry but I don't know its name. Let me know if you do. 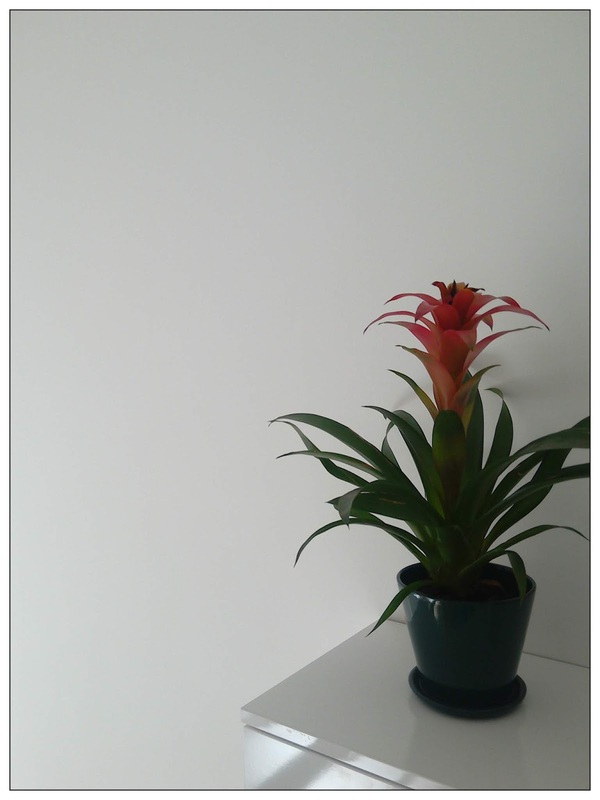 I bought a green ceramic pot to place this plant in, I think it looks rather nice. I'm still figuring out what plans and flowers I want in my home. Most of the ones I've put in my living room died because there is too much light and warmth, so I guess I will stick with succulents and cacti in the future. 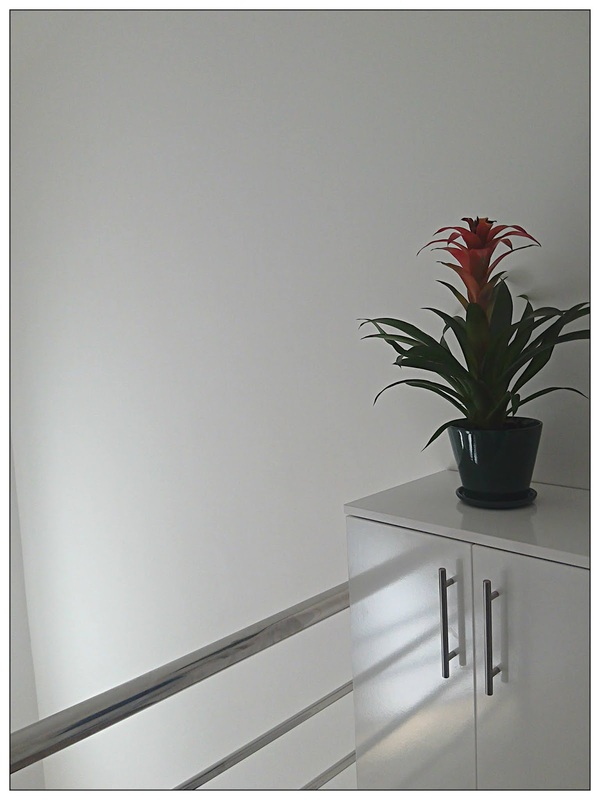 At the middle of the stairway (next to the window), you can see the typical Christmas plant. Some people throw it after Christmas, but I think that is very mean and anyway I see no point in its since then one has to buy it anew every year. I think this plant looks lovely and I placed these two plants in ceramic pots I bought. All the ceramic pots in my home with the exception of the green one you can see on the photograph above, have the same floral pattern, they only vary in size. Did I mention that I like when things match? Now, a few words about my outfit. It's about clean line and minimalist colours. Perhaps I was inspired by my new home. Those of you who have followed my blog for a while know that I've always loved patterns and vivid colours, but it seems like I'm changing. These days I also embrace minimalism looks. Black, dark blue and white are colours I'm starting to gravitate to. 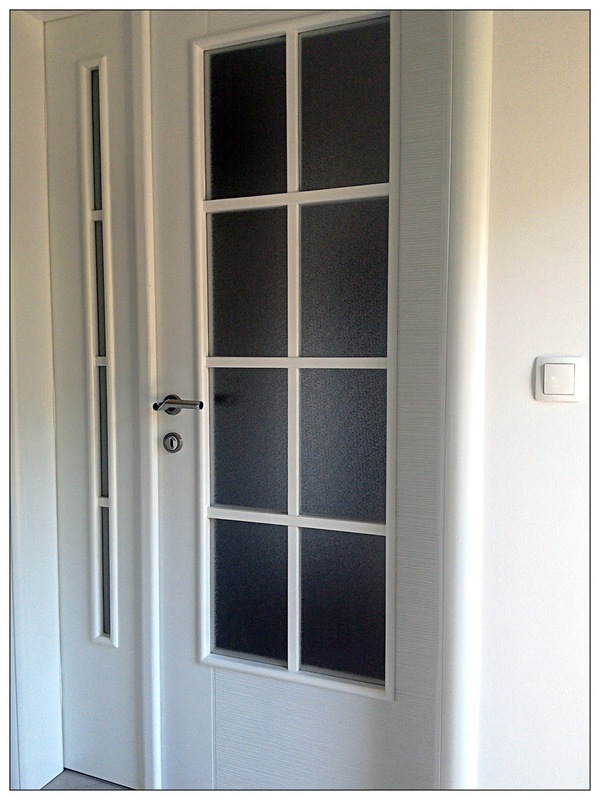 The elegance of black and white is something you can always rely on. How do you like this outfit? I can't remember what was the occasion I wore it for, but I remember that I loved wearing it. Have a nice day! I am absolutely obsessed with your outfit. The sleeves are so cute! its really nice and looks so comfortable . minimalist style is the future and never getting old . Hope that you are having a great week :) We have a birthday party this weekend so will be busy today getting organised for that! I hope that the birthday party will go well. I like the stairs. Also you look great in that outfit. My favorite colors mix. excellent and excellent dear. I know this post is about your new home (congratulations on the new home! 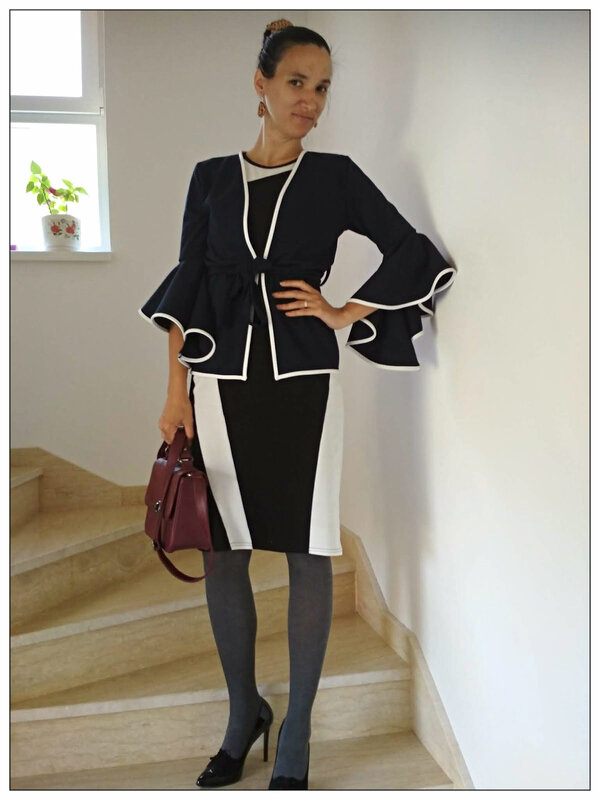 ), but I absolutely love your outfit in this post! I love your bell sleeve jacket, this dress, and these oxford-style pumps. This is honestly one of your loveliest outfits I've ever seen, and I've followed your work for years. 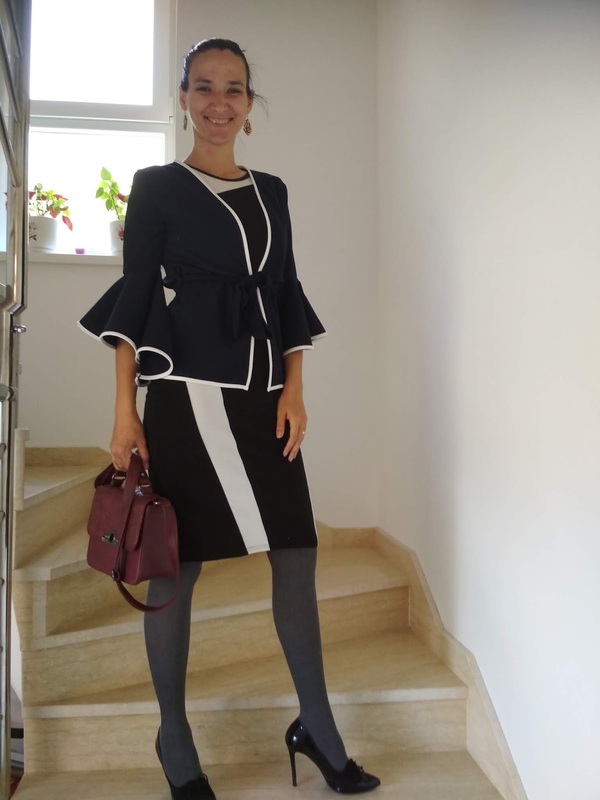 Sve mi se dopada, i stepenice i vrata i polica i biljcica, a posebno dama u savrseno elegantnom kompletu i na visokim potpeticama :) Pun pogodak!